We started handing out these rubber ducks at CITCON Amsterdam, for those cases when we are not around to pair (program, brainstorm, reflect, be innovative) with. 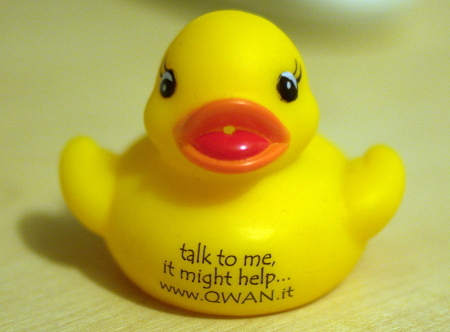 Talking out loud helps, and ‘rubber ducking’ is a well known technique for this (e.g. Kathy Sierra writes that talking to pets works even better. We came across it the first time in the Pragmatic Programmer ). We chose QWAN as a name, because we are still inspired by Christopher Alexander’s early work on patterns (Timeless Way Of Building) most notably. QWAN is a label for stuff done by Rob Westgeest, Marc Evers and yours truly, often in co-operation with others. QWAN co-created a bunch of new courses and workshops in 2008: experience refactoring (also with Octos’ Emmanuel Gaillot), unit testing masterclass, responsibility driven design with mock objects, dirty jobs (with Tjakko Kleinhuis), pimp my retrospective (with Topic’s Nicole Belilos), political games (with Emmanuel Gaillot), story testing with Rspec, and a revamped rightsizing your unit tests (and then some that I forgot. This collaboration seems productive, many more than last year it seems. We supported conferences in one form or another, e.g. by sponsoring, as co-organizers or ‘just’ running a session: CITCON Amsterdam, several Agile Opens, XP Days Benelux and London, ESSAP summerschool, Agile2009, AgileHolland. We’d like to thank everyone who participated in our courses, conferences and workshops. Your enthusiasm and feedback helps us to improve and, not least, have fun in our jobs. Everybody who provided encouraging feedback when we published our brochure earlier this year. Especially Nynke Fokma, Becky Winant and other keys for giving detailed suggestions for improvement. We’ve had several great customers (you know who you are), who created amazing conditions for us to focus on our work. Thank you! We made progress in selling open enrollment courses, and are still puzzling on better ways of selling those (as well as making it easier on our customers to plan and buy participation). The context for courses seems to be shifting at the moment – working more effectively has value, but many large corporations have the knee-jerk reaction of putting all training on hold when sales slow. At these corporations people have little time for training when things are good – too busy, and no budget for training when things are bad. Luckily we also have customers with a long term perspective, who invest in training, education and hiring continuously. We hope the ‘interesting’ economy will mark the breakthrough of lean and agile ways of working in more places. We hope to carry out more integrated on-site coaching … With integrated we mean doing whatever works best in a given context : a whole systems approach using combinations of lean, scrum, extreme programming with ‘soft’ skills inspired by Satir and systems thinking. We wish you a healthy, fun and prosperous 2009, and look forward to collaborating with many of you. This entry was posted on Friday, December 19th, 2008 at 3:50 pm	and is filed under people & systems. You can follow any responses to this entry through the RSS 2.0 feed. Both comments and pings are currently closed.